Solar Power in Schools: Let There Be Light! A teacher at a rural school tries to angle the mirror of a sunlight-illuminated microscope towards the window to light a biology slide. A student strains his eyes in the cool darkness of a classroom to read his textbook. Often we take for granted the role that power generation plays in everyday education. But not in rural Ethiopia. In 2014, only 12.2% of the rural Ethiopian population had access to electricity (World Bank, OECD/IEA, 2014). Lights to read by can allow students to use indoor spaces for studying and use them into the early evening. Microscopes can be illuminated by power instead of relying on the proximity of windows and brightness of the day. Teachers can access the programs provided via Ethiopia’s educational radio and television network (EMA) to supplement their teaching. Teachers and students can use technology devices, such as laptops, tablets, and smartphones. Alternative power sources, such as solar power, can reduce the reliance on expensive non-rechargeable lithium batteries, as well as reduce the health risks of lighting a space by kerosene lamps. 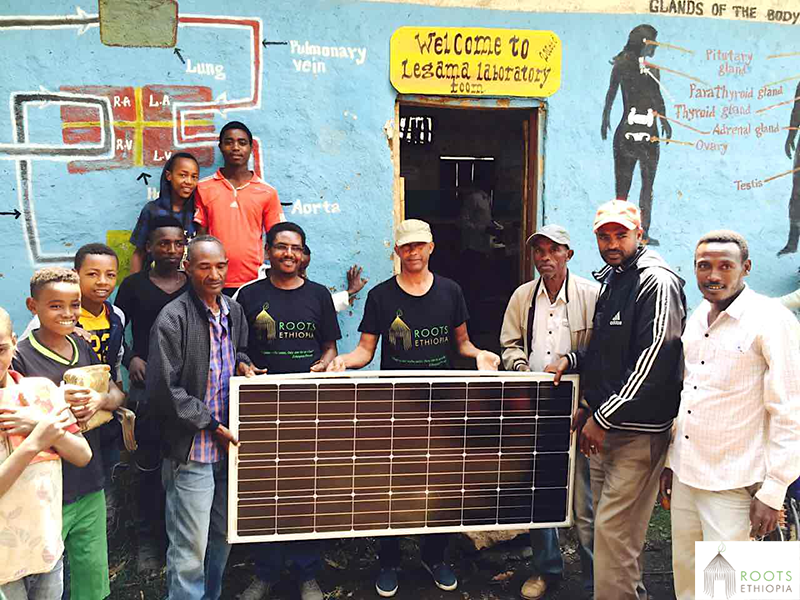 Roots Ethiopia has piloted solar panel installations in one of our newer schools, Lai Bedene Primary School in the Halaba Zone. With the money saved from using solar power for their educational radio, they are now planning to purchase a television for classroom use! The installation was so successful that we have implemented it in two more rural schools…Legama Primary School in Wolayta, and Gomora Gewada Primary School in Kembata. Reducing barriers that hold back rural schools from delivering a quality education is just one more way that Roots Ethiopia focuses its efforts on improving schools and educational quality. Help us to light the way to academic success for more students in every Roots Ethiopia School! Previous Previous post: School Sponsorship Supplies the School Supplies!